~Flash back four years to the lead-up to the 2009 NFL Draft. The Packers owned the #9 overall pick, and Dom Capers had just taken over and he needed bodies for the transition to his new 3-4 defense. The team, and the fans, had expected Kansas City to select nose tackle B.J. Raji with the #3 overall pick, and many experts were penciling perfect “prototype” 3-4 DE Tyson Jackson from LSU to the Packers with that #9 pick. Many Packer fans wanted the pass rush force at OLB, however. The highest-rated ones were Aaron Maybin from Penn St. Bryan Orakpo from Texas, Everette Brown from Florida State, and Larry English from Northern Illinois. Well there was a surprise at #3 as the Chiefs selected their “prototype” DE in Tyson Jackson. That plummeted Raji down. So at number nine, Dom Capers had his guy that he dreamed of to start his 3-4. Raji was seen as the rare big fella who could both anchor down the point of attack, and also beat a double-team and get pressure on the quarterback. What Thompson didn’t expect was for both Raji, and Texas Tech WR Michael Crabtree to be available. Rumor has it that Thompson had Crabtree rated as his highest rated player on the board there. But he gave Capers his guy and selected Raji. Where Thompson made his most brilliant move as GM, to date still today, was trading back up into round one and getting the #26 pick from New England. He used that pick to select Matthews, who was considered by most to be a 2nd or even 3rd round prospect. Analysts were shocked that the Packers traded their 2nd and two 3rd round draft picks to the New England Patriots in order to secure Matthews as well as a 5th round selection. 2009 saw Thompson give Dom Capers both the NT and OLB he needed to move this defense to a 3-4. Everette Brown was still available, and many Packer fans wanted him to be the guy chosen with that pick. Maybin, English, and Orakpo had already gone and given their pass rushes to Buffalo (#11), San Diego (#16), and Washington (#13). But Brown had a great highlight package of sacks and Packer fans were salivating over adding him to Raji. Thompson shocked folks and took Matthews. He immediately paid dividends. Matthews recorded 51 tackles, 10.0 sacks, 7 pass deflections, a forced fumble, and 3 fumble recoveries in his rookie season of 2009. He played in all 16 games, starting at ROLB in 13 of them. He led the Packers in sacks, QB Pressures, with 45.5. He finished 3rd for NFL Defensive Rookie of the Year, losing to his former USC teammate Brian Cushing. He was named NFC Defensive Rookie of the Year and set the Packers record for most sacks in a season by rookie (10.0). Matthews was named to the Pro-Bowl, being the first Packer rookie to be named to the Pro-Bowl since James Lofton in 1978. In 2010, his second season, he was even better. Matthews finished a close second (17 votes to 15) to Troy Polamalu in the AP NFL Defensive Player of the Year voting, notable in that both led their defenses to Super Bowl XLV. 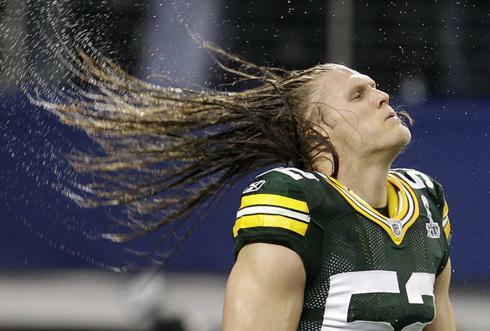 2010 Playoffs: Matthews set the Packer record for most sacks in a postseason (3.5). In the Super Bowl won by the Packers over the Pittsburgh Steelers, he had 3 tackles, a pass deflection, and a game changing forced fumble. On the first play of the 4th quarter with the Steelers driving to take the lead with the score 21-17 in favor of Green Bay and the ball on the Packer 33 yard line, he tackled Steelers running back Rashard Mendenhall, who fumbled the ball, recovered by Desmond Bishop. The Packers never lost the lead, winning their 4th Super Bowl title and first since Super Bowl XXXI (1996 season), 31-25. Matthews deserves a new deal today. Prior to the 2012 NFL season, Sporting News listed Matthews as the 2nd best outside linebacker in the league, 2nd only to DeMarcus Ware. Matthews started out the 2012 season with a bang. He recorded 3 tackles and 2.5 sacks against San Francisco in 30-22 loss and then posted a career high 3.5 sacks of Jay Cutler against the Bears on Thursday night. Matthews is one of only 6 players in NFL history to record 6 sacks or more in the first two games of the season, and is the only player to do it twice. Matthews missed some time later in the season with a hamstring problem, but he still finished with 13 sacks, a half-sack short of his career high from 2010. None of this greatness is news to any football fan, especially Packer fans. But the point is that Matthews is still playing on that “bargain” rookie contract now entering his fifth NFL season. His contract his up after this season. His original contract is a 5 yr/$13.1 million dollar deal. His base salary so far, after four years, has yet to hit $1 million in a year. His biggest cap hit was last year at 1.98 million. Full details here. He hasn’t whined like Javon Walker. He hasn’t threatened a holdout like Darrelle Revis did a few times, and like Sterling Sharpe did once. He hasn’t held out like Chris Johnson and Eric Dickerson did so many times. He’s just played. And played like a Hall of Famer. Quietly. Underpaid. Remember the 2008 season, Aaron Rodgers entering his 4th NFL season but first as a starter with Favre jettisoned to the Jets. The Packers gave Rodgers a new deal just a few months into his real career began, again in his 4th season. Matthews is basically THE pass rush. Without him, QB's would have all day to pick apart the secondary. Matthews has played a full four now and been the defenses clear MVP. Without Matthews, this defense would be atrocious. He’s still only 26, and he has great bloodlines. His dad played 19 seasons in the NFL, also as a linebacker. And Clay’s uncle played 19 seasons as well, playing in an NFL-record 14 straight Pro-Bowls. So you have a phenomenal player, who has been consistent, and professional, has great bloodlines, and hasn’t said a word in public about out-performing his contract, and he has just one year left on it. Rodgers still has two years left on his contract (his second contract already). And did I mention the hair? ~GREEN BAY – This time of year, he can sympathize with Ted Thompson. Bill Polian’s been there, heard that. When Polian called the shots with the Indianapolis Colts, the pressure to sign free agents ran high each spring. From fans. From the media. From people in house. Rather than cave, he remained steadfast. The NFL draft. His franchise quarterback. That was the emphasis. So to those around here irritated that the Packers general manager Ted Thompson has done zilch through free agency, Polian chuckles. Polian might be right. He says Thompson is doing the right thing by emphasizing extensions to Aaron Rodgers, Clay Matthews and B.J. Raji above signing any player from any other team. A rewind look at last year’s free-agent class supports Thompson’s propensity to tiptoe through March. 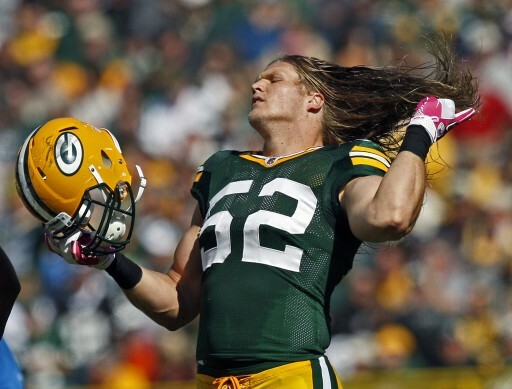 Thompson has to save a lot of money for new deals to Clay Matthews, who has out-performed his contract more than, perhaps, any other player in the NFL since 2009. And he's done it without a peep. Matthews deserves a new mega-deal soon, before quarterback Aaron Rodgers. Too often, spending backfires – particularly lately. While some of last year’s free agents shouldn’t completely be written off quite yet, 2012 exposed more panic signings, more regrets and more disappointments at each position. This, of course, came one year after the Philadelphia Eagles’ unmitigated “Dream Team” disaster. No, Thompson shouldn’t completely be off the hook from critics. One or two cost-efficient signings – a Chris Canty, a Cullen Jenkins, a short-term fix at a position of need – might certainly help. But as far as spending big in general goes, Thompson’s restraint keeps the Packers out of trouble. Over a six-year study, Polian determined that 50% of free-agent signings panned out. Or, as he put it, the same rate as (much) cheaper, smart NFL draft picks. Rodgers new deal might be the first $25 million a year deal in the NFL. That takes up a huge chunk of cap space, deserved or not. Last year was full of mistakes and growing regrets in the NFL. San Diego signed Jared Gaither to a four-year, $24.6 million deal (13.5 million guaranteed), and the offensive tackle reportedly milked injuries before landing on injured reserve. One veteran told the San Diego Union-Tribune, “I can’t even look him in the eye” after Gaither sat out with a back issue.” Gaither made $2.25 million for each game he played in last season. No decision has been made on him yet this off-season. As much as the Chargers might want to release Gaither, it’d also be a $6 million hit. This month, new general manager Tom Telesco said no decision has been made. Right tackle Eric Winston, who signed a four-year, $22 million deal with Kansas City, was released. Steve Hutchinson signed a three-year, $16 million deal ($6 million guaranteed) with the Tennessee Titans, regressed sharply at 35 years old and retired. One year later, the Titans paid $46.8 million/six years for Andy Levitre. Tampa Bay’s Carl Nicks might be a long-term answer, but the 2011 all-pro landed on injured reserve with a toe injury. St. Louis Rams center Scott Wells also finished on IR. After signing at four years, $24 million ($13 million guaranteed), Wells has undergone three surgeries in seven months. The Packers missed Wells in 2012. And he very well could rebound in 2013, but the injuries are troublesome for a 32-year-old center. Green Bay Packers general manager Ted Thompson has avoided free agency more than any other NFL GM, and it has seemed to have worked pretty well. But adding a guy like Steven Jackson would have been a wise move, considering the cost and the ability of the player. This team was passed by a few teams in the NFC last year, and as good as Thompson is at drafting, he can't rely on that making his team catch and pass the others like the 49ers, Falcons, Seahawks, Giants. A look back at last year's draft proves this. Nick Perry and Jerel Worthy were Thompson's top two picks, and in the end, they provided virtually nothing. Then, there’s the defensive line. At six years, $96 million ($50 million guaranteed), if Mario Williams is anything short of a combination between Reggie White and Deacon Jones, it’s probably a letdown for Buffalo. To his credit, Williams rebounded from a sloppy start to finish with 10.5 sacks. Still, 14 players had more sacks than him. Williams was brought in to trigger cosmic change, to have a White-like influence on other free agents. One year in, the Bills’ defense allowed 146 rushing yards per game, 31st in the NFL. Green Bay expressed some early interest in Kendall Langford but wouldn’t play ball. If Thompson deserves some flak, it should be at defensive end where he’s been reluctant to spend. The four-year, $24 million deal Langford signed with St. Louis is the going rate for such a 6-foot-6, 295-pound anchor of a 3-4 DE. Then again, Thompson deserves props for not biting on pass rushers. A disruptive 3-4 outside linebacker was the team’s No. 1 need last off-season, but the GM didn’t get into any foolish bidding wars. Kamerion Wimbley, a 3-4 OLB his whole career, signed with the Tennessee Titans at $35 million over five years ($13.5 million guaranteed). And at defensive end, he struggled. The Titans swung, missed on Williams and reached for Wimbley. In 2012, the 6-foot-4, 255-pounder had 30 tackles and six sacks. This is the nature of free agency. Teams overspend on second-tier players. Players like Wimbley, who averaged seven sacks per season, can be overvalued. That’s why it was always easy for Polian to stay on the sideline. There was one A-plus free agent last year: Peyton Manning. He appears to be worth every penny in Denver. Tampa Bay’s Vincent Jackson (five years, $55 million) and St. Louis’ Cortland Finnegan (five years, $50 million) made a first-year splash, too. At wide receiver, there’s also Laurent Robinson and Robert Meachem. Robinson reached a five-year, $32.5 million deal with Jacksonville. And after four concussions in one season, he was released. Robinson’s football career in general is now at a crossroads. In San Diego, the Chargers lost Jackson and rushed into a four-year, $25.9 million deal for Robert Meachem. Last season, Meachem was a magnificent failure, catching 14 passes for 207 yards. The New Orleans Saints needed help on defense. Badly. So the Saints forked over five-year contracts to a pair of linebackers – Curtis Lofton at $27.5 million, David Hawthorne at $19 million. And in 2012, the Saints allowed more yards than any team in NFL history. Two days after his reinstatement, Sean Payton fired defensive coordinator Steve Spagnuolo. Two outside linebackers – San Diego’s Jarret Johnson and Buffalo’s Mark Anderson – were likely overpaid at $19.5 million over four years. And behind them, the verdict’s still out on players. Cornerback Brandon Carr signed with the Dallas Cowboys at five years, $50.1 million contract ($25 million guaranteed). The Cowboys’ secondary remained shaky, finishing 29th in opponent passer rating (94.7). Carr’s $14.3 million base salary this season was reduced to $715,000, though the difference was converted to bonus money spread out through his deal. And after signing a five-year, $38 million deal with Tampa Bay, cornerback Eric Wright was suspended for using performance-enhancing drugs, which wiped out his 2013 guaranteed money. The Bucs now could release the disappointing cornerback without a penalty. The salary cap is not rising. Thus, “dead money” is becoming a bigger issue for teams, Polian said. In years past, it was easier for teams to roll the dice on a player because GMs knew the cap would continue to rise. Yet many general managers continue to spend. And spend. The reasoning is simple. Many bosses, Polian says, feel they need to appease the masses. “The marketing people say, ‘We have to do something. We can’t be perceived as not trying to win,'” Polian said. “Different GMs try different philosophies. Let’s load up on midpriced free agents, we’ll play money ball and hope we hit on a few. Others say, ‘We need that big, marquee signing. We’re one or two players away.’ None of it really adds out. That’s precisely what the Packers have in Rodgers, Matthews and Raji. Green Bay might pay for not being more aggressive. A piece here or there could help. By standing pat, the pressure on young players rises. Big picture, however, Polian praises Thompson for showing restraint. It’s impossible for any Super Bowl team to keep its core together long term. The Baltimore Ravens learned that quickly. But by resisting the urge to spend on other teams’ free agents in March, a team can keep its own “A” players around. With the Colts, Polian did this. And with the Packers, Thompson is attempting to do the same. ~PHOENIX – In an interview earlier this month, Tramon Williams suggested he might never be the same because of the nerve damage he suffered in his shoulder in a collision with safety Nick Collins in the 2011 regular-season opener. On Wednesday, Green Bay Packers coach Mike McCarthy expressed hope that the one-time shutdown cornerback can regain his 2010 form, when he was a dominant cover man during the Packers’ Super Bowl XLV title run. Tramon Williams was injured here back in the 2011 opening game versus the Saints, and he hasn't yet fully recovered. Credit him for toughing it out and still suiting up and still doing his best. Many other Packers would have been IR'd with such an injury. Williams’ teammates clearly knew there was something amiss with him, as they voted him the team’s Ed Block Courage Award winner for battling through the injury and facing opposing No. 1 receivers week-in and week-out. McCarthy said at Wednesday morning’s NFC coaches breakfast at the NFL Meetings at the Arizona Biltmore hotel that the medical and coaching staffs will be meeting with Williams when the offseason program begins April 15 to determine where the shoulder is in the healing process. “When he gets back, we’ve probably got to get on the same page with that, as far as where he is and the testing and so forth,” McCarthy said. “Tramon’s a pro. He sits in the front row, takes notes, goes about his business the right way every day. I know he wants to get back to the way he played in 2010. Because that was an incredible year for him personally. ~PHOENIX – Mike McCarthy can’t say whether 2011 first-round draft pick Derek Sherrod will able to compete for a job this year, and he won’t say whether he’s mulling the idea of shifting Bryan Bulaga to left tackle. But the Green Bay Packers coach made this point crystal clear: He’s going to demand better performance from the offensive line, especially the left side of the line and the center position. McCarthy didn’t raise his voice during Wednesday morning’s NFC coaches breakfast at the annual NFL Meetings at the Arizona Biltmore hotel, but he certainly put left tackle Marshall Newhouse, left guard T.J. Lang and center Evan Dietrich-Smith on notice that he expects them to play better than they did last season, when the quarterback Aaron Rodgers was sacked a league-high 51 times and the running game ranked 20th in the league in rushing per game (106.4) and 22nd in yards per attempt (3.9). Either Newhouse will have to improve, or else be replaced, possibly. “The one thing about Marshall (when) you go back through the grades, Marshall played OK,” McCarthy said of Newhouse, who took over as the starting left tackle during veteran Chad Clifton’s injury-plagued 2011 season and started all 18 games (including playoffs) last year. “We need some improvement from the left side of our line. If you’re breaking down the line as a whole, our left side and the center position, we need improvement there. I thought (right guard) Josh Sitton probably had his best year. And frankly, Bulaga and (undrafted rookie Don) Barclay at right tackle with Josh was, we felt, a good combination. We need to get the left side to play better.” That response was to a question about the idea of shifting Bulaga to left tackle, especially in light of Barclay’s surprisingly solid play in the final six weeks of the season. Barclay certainly had his growing pains, but after Bulaga went down with a season-ending hip injury on Nov. 4 and Lang initially shifted to right tackle, Barclay did a passable job at the position. McCarthy said he liked what he saw from Dietrich-Smith at times after the decision to bench veteran center Jeff Saturday with two games left in the regular season, but that Dietrich-Smith, who is a restricted free agent and received the low $1.323 million tender, has to improve, too. “I felt the way we finished the season, he had segments of games that he didn’t play as well as he should have,” McCarthy said. ~Oh man, Packer fans are taking this hard. Twitter is a cesspool of bad language and foul imagery. Vikings fans certainly didn’t demonstrate such uncouth behavior when the Packers signed away Koren Robinson in 2006. Instead, they stayed classy. Hey, just because the Vikings had released Robinson after a high-speed car chase in Mankato, it didn’t mean they might not have signed him back. Favre gave the Vikings one fantastic season, with his signature playoff-killing moment right at the end. But now all the Packer backers are going screwy, as if Greg Jennings were Brett Favre or something. Besides, I’m not even sure if the Packers can blame Jennings for defecting. By all accounts, the Vikings locked him up at Winter Park and wouldn’t release him until he agreed to a deal. That was a smart strategy because, as any car salesman knows, once you let a guy get off the lot, he’s pretty much gone for good. The signing was an excellent one for the Vikings because it brings their total number of capable receivers up to, well, one. But you have to start somewhere. And the Vikings are almost back to even after getting rid of Percy Harvin. If they can use their draft choices to come up another good wideout, they will be ahead of the game. Jennings, meanwhile, said it came down to either the Vikings or Packers before adding that the Vikings really “stepped up to the plate.” Then, intentionally or not, he sort of tweaked the Packers several times. Just little things such as going on about how the Vikings have a window of opportunity that is opening instead of closing. And there was none of the usual remorse that comes with ending a long relationship. Not even the fake kind. There was none of that “I’ll always be a Packer” stuff or anything like that. It was as if he were shaking the dust from the bottom of his shoes. I’m not sure what was going on there, but Jennings seemed gleeful to get away and start fresh. Maybe the window really is closing in Green Bay. But I’m not going to speculate because those poor folks are riled up enough. Clearly, this is tantamount to treason as far as they are concerned. So I’m not going to poke the bear with a stick. Greg Jennings will help the Vikings passing game tremendously, as long as he's healthy. This is a bigger splash than we thought the Vikings would make. Spielman and his crew have proved to be adept at drafting players but spotty at signing free agents. In fact, there were a few miserable signings last year. However, it’s hard to see where this one could go wrong. If Jennings is healthy, and I’m sure he had to pass a physical, there doesn’t appear to be much downside. Some might say Jennings isn’t quite what he once was, even though he’s just 29. But it’s all relative. He’s 10 times better than anything the Vikings have right now. So they’ve addressed their most vulnerable position. Christian Ponder — and maybe Matt Cassel before it’s all said and done — now has a capable wide receiver. Jennings already had his “we” and “them” down properly as of Friday night. Whatever they gave him to drink while locked up at Winter Park, he no longer thinks like a Packer. And he sounded as if he were looking forward to the two teams colliding. “I’m not the first Packer player to jump on this side,” he said, no doubt referring to former kicker Ryan Longwell. Or maybe he was referring to the elderly quarterback. Anyway, it wasn’t clear. The bottom line is that this was a good day for all those who root for the Vikings and an equally good day for all those who root against the Packers. In other words, Vikings fans hit the daily double. Let’s see, Favre, Longwell, Jennings. … The Vikings are almost even for that Koren Robinson signing. But on the off chance that Jennings doesn’t work out, when does that young Randall Cobb become available so he can get over here? ~Greg Jennings chased the money. Don’t blame him. In any way. He has every right, and many people — from NFL players to the mailman to the supermarket worker to the corporate exec — would also chase the cash. It’s the American way. So get your money, Greg. Straight cash, homey. That does not mean Jennings will have success with the Vikings. In fact, it’s all but certain that Jennings’ career will die a slow death. There may be a high moment or two but there likely won’t be a Super Bowl. Jennings went from Aaron Rodgers to Christian Ponder. I like Ponder more than most (OK, I’m the only one who likes him) but even as a Ponder backer, he’s not in the same galaxy as Aaron Rodgers. And Matt Cassel is even worse. So Jennings made the classic decision. He got his money but his career is all down hill from here. The Packers will continue to fight for Super Bowls and Jennings will disappear like he’s wearing a cloaking device. That sounds harsh and arrogant, but it’s accurate. Jennings is outstanding, but we’ve seen what happens when a good receiver has a mediocre pass thrower. Larry Fitzgerald is all-world but when he comes out of his breaks on a pass route, the ball might hit him in the hands, or it might land in the dirt, or it might go into the stands. So a great weapon like Fitzgerald is partially mitigated because his quarterback is putrid. This is what will happen with Jennings. Not to mention that Adrian Peterson gets 7.8 million carries a season. So Jennings will do a lot of blocking and a lot of Peterson-watching. Jennings will also have to learn how to chase. You know. Chase the defensive back down that picks off Ponder.